William C. “Bill” Paar, 70, of West Bend, passed away peacefully on Tuesday, October 16, 2018 in Butternut, WI. He was in what is often called “God’s country” at his little cabin in the north woods. The autumn beauty that surrounded him in a place he treasured for its tranquility and countless memories; doing what he loved is exactly where he was supposed to be. Bill was born on August 20, 1948 in Milwaukee, the son of the late Carl and Martha Paar. He adored his family and was very proud of where he came from. He had many stories of his childhood and the mischief he would get into with his neighborhood friends and siblings. 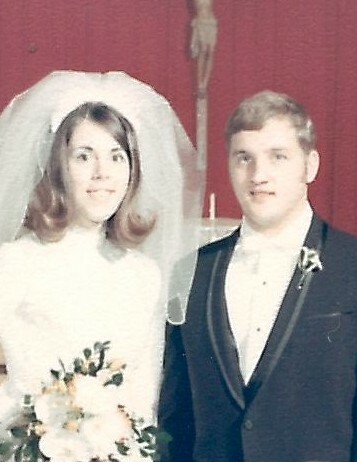 Despite his foolery, he still managed to win the heart of Bonnie Backus and joined her in marriage on October 25, 1969 in Horicon, WI. They were married 48 years until she passed away on December 23, 2017. Bill had a zest for life that got him out of bed every morning and a determination to make each day the best he could. He valued spending time with his family and thrived on time spent with his friends. He enjoyed photography, hunting, fishing, canning vegetables from his vegetable garden, and listening to any Wisconsin sports team on the radio while tinkering in his garage. His strength, character and indelible approach to life will always be admired. However, the loss of his beautiful bride Bonnie less than a year ago took the wind out of his sail. He enjoyed life the best he could but it wasn’t the same without his best friend to share in it. He is now eternally united with “his Bonnie” in heaven. Those Bill leaves behind to cherish his memory include his two children, Justin and Bethany (Duffy) Teipel; five grandchildren, Tully, Tallulah, Arleta, Finola, and Renny; and one sister, Dianne (James) Lentz. He is further survived by other relatives and many friends. In addition to his parents and his wife, Bill was preceded in death by his siblings, Richard Paar, Elizabeth deGalley, and Deborah Palskill. A Memorial Mass will be held on Tuesday, October 23, 2018 at 4:30 p.m. at St. Mary’s Immaculate Conception Catholic Church, 1610 Monroe St. West Bend, WI. 53090. The Rev. Nathan Reeseman will officiate. Bill’s family will greet relatives and friends from 3:00 p.m. until the time of Mass. Private burial will take place at St. Mary’s Cemetery. In lieu of donations, Bill would want you to go out for a ribeye steak, buy a loved one a hot fudge sundae with pecans or take time to enjoy this moment.